Some 140 travel agents from the The Travel Agent Next Door collective have descended on Punta Cana in the Dominican Republic, to take part in the group’s fourth annual educational conference, reports Press Today’s Ted Davis, who’s at the event. Dubbed “On A Mission,” it has already featured a Spy vs. Spy theme night, during which members turned out in their best secret agent gear, ranging from trench coats to fedoras and moustache disguises. The all-Canadian conference has drawn attendees – about half who are from Ontario – to the Majestic Colonial Resort, a sprawling property on Punta Cana’s sandy coast. The agents spent the first full day of the gathering taking in an opening presentation by TTAND founder Flemming Friisdahl, who described the goals of the collective and emphasized that its success can be traced back to the performance of each agent member. “I’m invested in your success,” Friisdahl told his audience. He also described some the key achievements by TTAND over the past year. These include joining the Ensemble travel agent group, introducing a new Extranet and offering BSP ticketing for groups and AC. He also described the philanthropic program “Pencils For Kids,” which TTAND has adopted as a cause. Founding member Robin Mednick was on hand to outline the goals and accomplishments of the program, which has raised donations for the building of schools and the start-up of farming education courses in poverty-stricken Niger. Friisdahl’s keynote was followed by presentations by preferred suppliers Transat, Crystal Cruises and Tourcan Vacations. In addition to product descriptions and pointers on selling techniques, some suppliers marked the sales performances of their top agents with prizes. 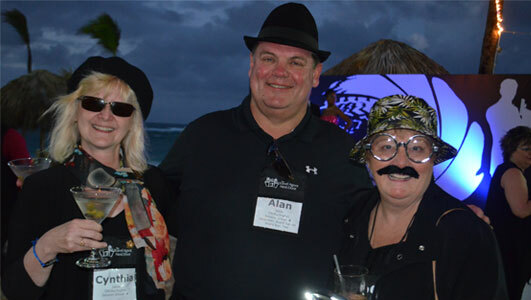 Attending the opening night Spy vs Spy party at The Travel Agent Next Door conference in Punta Cana were TTAND agents (l. to r.) Cynthia Iskiw and Alan Iskiw of Burlington, with Becky Kershaw of Tillsonburg.